Laos: Lives on the line in river revelry !! Boozy fun in Laos comes laced with danger, writes Belinda Merhab. There were several ways I could have died while travelling through Laos - or at least got into a decent amount of trouble. There was the night I was frisked at gunpoint by authorities on the street and almost arrested for being out past the communist Government's midnight curfew. Or the day I took a hot-air balloon ride with a pilot who didn't know how to land. We eventually disembarked in a small village where 10 Laotian men tried unsuccessfully to hold the balloon down before our pilot continued floating into a mountain range. We never did find out what happened to him. And then there was the day I went "tubing" - floating down the Nam Song River on a tube, stopping at bars along the way to drink booze by the bucketload - an entertaining but highly dangerous pastime that claimed the lives of two Australians earlier this year. They died just weeks after I had returned from my trip, having raved about how much fun tubing was and how it had been the highlight of my Southeast Asian adventure. Having said that, it was never a secret to any of us that tubing was a risky business. While our tour allowed a day in Vang Vieng for tubing - there's not much else to do there except for lounging in a bar drinking sangria and watching re-runs of either Friends or Family Guy - it was considered free time as our tour company was unwilling to bear the risk. Our tour guide - who warned us several times that people regularly died on the river - was forbidden by the company from tubing himself. 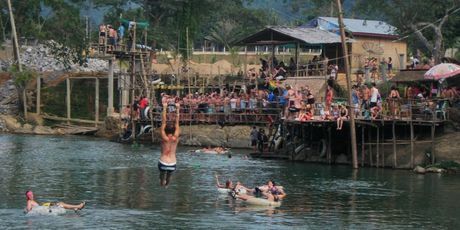 From about midday in Vang Vieng, hundreds of travellers from all over the world converge on the riverside bars. Some get to bars on foot while others rent a tube and float along the river from bar to bar, amid stunning mountainous scenery. Each bar has a person whose job it is to throw a rope into the water for revellers to grab on to, so they can be reeled in to the next party. Once you're there, you're offered/forced to drink free shots of potent Lao whisky - the same whisky that almost killed Australian teenager Annika Morris, whose heart stopped several times after drinking it. Sometimes there is free food. You can jump from podiums, swing from trapezes over the water or slip down water slides - all of which I avoided. Inhibitions are completely lost as strangers drink from communal bottles of booze and buckets of cocktails, decorate each other with marker pens and spraypaint, and sing and dance. By about 5pm, most of us headed back to return our tubes before nightfall to get our deposits back. At this point my fellow travellers and I grew concerned about how to get off the river. We made a human chain by grabbing each other's tubes and floated until we saw a clearing on the river's edge. We helped each other climb up the bank, and even took a victorious "we survived tubing" photo once we found a tuk-tuk to get us back to town, where we rewarded our survival with deep-fried Nutella pancakes from a street-side vendor. Things did get a little hairy there and it was lucky that a group of us stuck together for support. But then flirting with danger was rather the point of the exercise. Indeed, Dr David Beirman, a senior lecturer in tourism, points out that it has always been a rite of passage for young Antipodeans to engage in risky behaviour when travelling overseas. "You always find there are a certain number of people who feel it's sort of a rite of passage to do something really dumb, particularly if it's the first trip away for a young person - young people think they're bulletproof," said Beirman. "Years ago it was going to the running of the bulls in Pamplona. In Laos, they just get a rubber tube, jump into the rapids and hope for the best."